Israel allowed senior Fatah officials and their families to move to the West Bank, via Erez crossing. 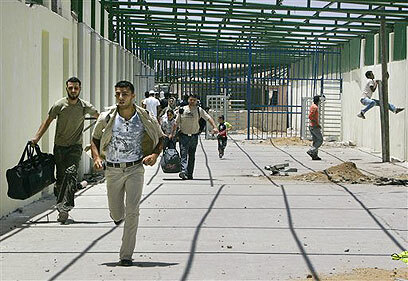 Security sources confirmed Saturday that some 200 Palestinians had come through Erez crossing in recent days, and about 60 had not returned to Gaza. Among those not returning were Fatah members who were detained by Hamas operatives in recent days and released after the Islamist organization granted a general pardon to senior members of its rival faction. The group also included Fatah spokesmen Tawfiq Abu Hussa and Maher Miqdad, National Security Organization Commander Jamal el-Qaid and Fatah secretary in the Gaza strip Majed Abu Shamala. Hamas forces recently attacked and broke into Miqdad's home, after killing a large number of Fatah gunmen who were protecting the building. The Fatah leader had managed to escape the area prior incident and, according to associates, is now in Cairo. Most of the other senior Fatah members have chosen to go to Ramallah, where they can join Fatah's former leader in Gaza, Mohammed Dahlan. Other Palestinians who were able to make it through Erez in recent days were those with VIP IDs – representatives of international organizations, merchants, or individuals in possession of foreign passports. Among them were 137 merchants with entry permits into Israel who have since returned to Gaza. The IDF had prevented the passage of civilians since Saturday afternoon, Palestinian sources said. Saturday morning, a number of families were able to pass through, but hundreds of Palestinians who arrived at the crossing Saturday afternoon were not authorized to cross over. Dozens of Palestinians stormed Erez crossing Saturday afternoon, demanding they be allowed to cross over into Israel. Palestinian sources reported IDF troops fired into the air to try and control the crowds. Hundreds of Palestinian later broke into the Palestinian side of the crossing and began looting it. The crossing was closed for security purposes, a security source explained. "Terrorists can easily hide among large groups of Palestinians and get through to commit a suicide bombing. As such, we decided to close the crossing." The source explained that Israeli-Palestinian cooperation had ceased, because of the Hamas takeover of the area. "Up until three days ago, Erez crossing operated with limited coordation, but three days ago Hamas took over outposts 100 meters from the Palestinian side of the crossing and Fatah members are scared to pass through the area," said the source. Erez is linked to the Rafah and Karni crossings, which were taken over and closed by Hamas gunmen. 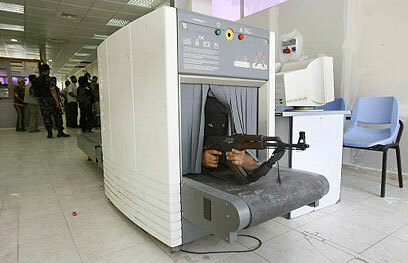 Hamas gunmen deployed to checkpoints at Rafah crossing formerly manned by European Union inspectors. Security sources said operating the crossings in the current situation was logistically problematic. "There is no one with whom to coordinate, not even international organizations." "The foreign workers have left Gaza and local employees are barely working. We are told that Hamas determines who will move in Gaza." See all talkbacks "Fatah members transferred to West Bank"